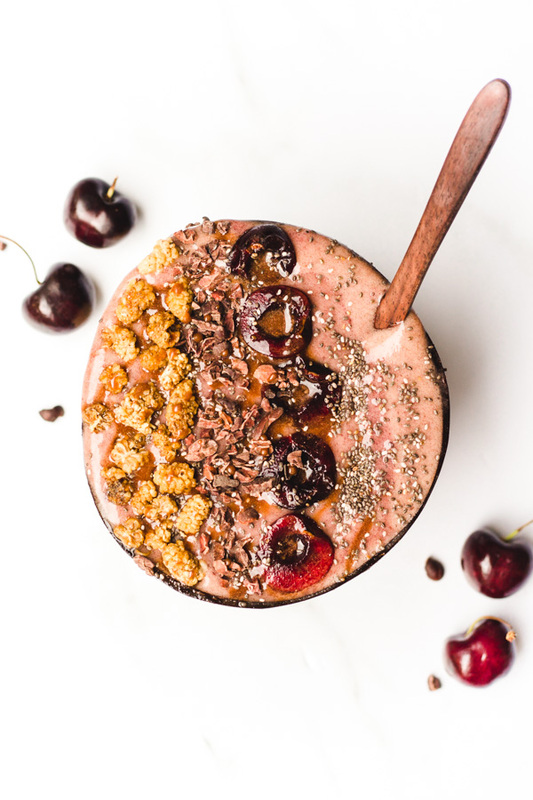 Sweet sweet chocolate meets juicy cherries in this delicious vegan breakfast fruit smoothie bowl! Two things I'd never thought I'd eat together - chocolate and cherries. 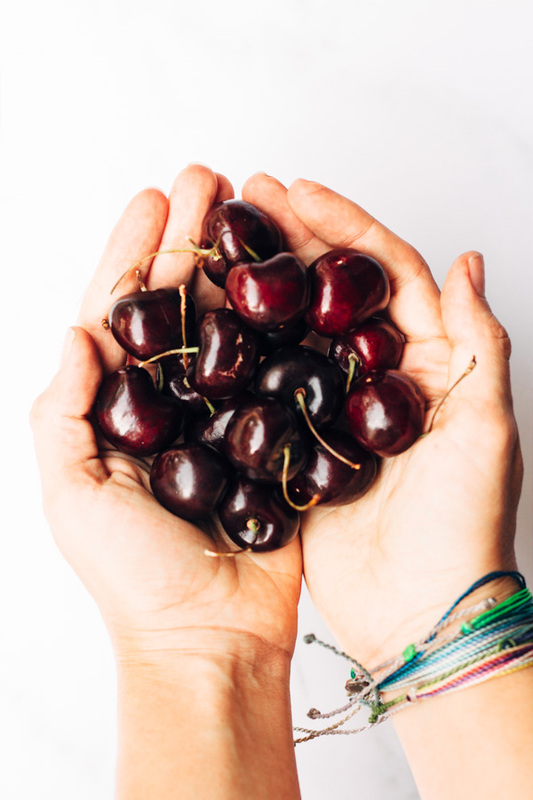 I hated cherries growing up, mostly because I thought the only cherries that existed were those really bright red, and overly sweet, artificial tasting cherries... you know which ones I am talking about? I avoided cherries, and anything cherry flavored for a reallyyy long time. But then, I tried a REAL cherry. Oh em gee. Nature really is miraculous. Why do we insist on taking real natural food and making it artificial? I'll never understand. Anyway, back to cherries and chocolates and smoothie bowls. Smoothie bowls are all the rage now a days. You can find them on Instagram mostly and of course in your favorite health-oriented cafes and restaurants. 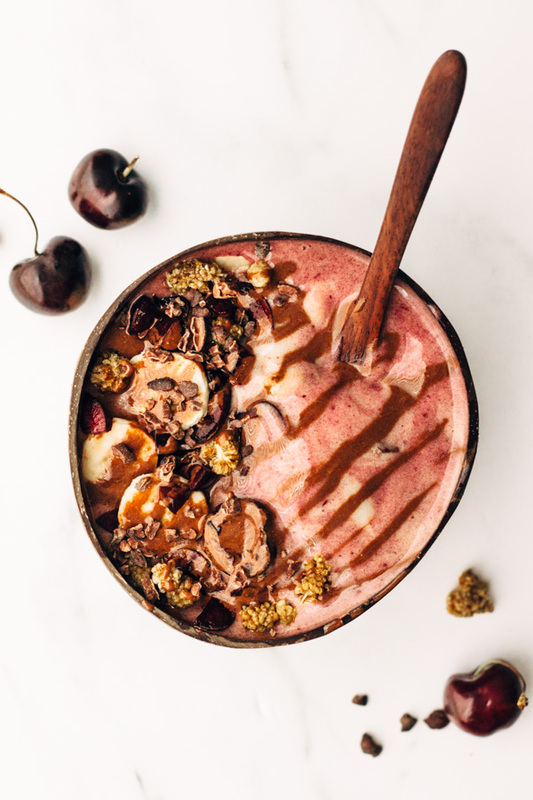 Rightfully so, smoothie bowls are super popular because 1. they are really simple and easy to make, and 2. it's a delicious sweet treat that tastes like junk food, but really it's a powerhouse of nutrition hidden under all those sweet sweet toppings. Contrary to what Instagram makes you believe, your smoothie bowl does NOT need to look like it's straight out of a vegan-food-magazine photo shoot. Do not be intimidated by the smoothie bowl creation process. Do not assume that if your smoothie bowl looks 'ugly', it will not taste as good. Trust the process, and your imagination. Some frozen fruits - frozen bananas are usually the fruit of choice as a base because it works really really well. But of course if you do not like bananas you can try all sorts of frozen fruits like mangoes, strawberries, berries ect. Toppings, several different kinds for best outcome. The beauty of a smoothie bowl, to me at least, comes from its toppings. I can drink a smoothie out of a cup, but in order to make it a 'bowl' it must have some delicious crunch on top to make it worth my while. Get creative. Some great toppings include - mulberries, chopped nuts, seeds, chia seeds, hemp seeds, cacao nibs, sliced bananas, other sliced/chopped fresh fruits... so many options really. A drizzle on top - okay this one is not required but, c'mon, you guys know by now how much i love DRIZZLE. In this recipe we are making a sweet chocolate drizzle, but feel free to get creative and make your own. You can even use coconut butter as a drizzle, too. And lastly, you'll need a blender or a food processor. For ultimate creaminess I like to use my vitamix blender (affiliate link) ... but I find that a food processor gets the job done just as well, and is probably easier to work with. Food processor containers tend to be wider, and that helps the frozen fruit break down easier without adding much liquid. A blender on the other hand usually has a more narrow container which means you're really going to have to push that frozen fruit down (using a tamper) and add non dairy milk (or water) to help the blender break down the frozen fruit. The choice is yours. Make a habit out of freezing ripe bananas (or your choice of fruit). I use these silicone freezer bags (affiliate link), and I almost always have a stash of frozen banana chunks in there. That way whenever I am in the mood for a frozen fruit smoothie bowl, I don't even have to worry about not having the banana frozen already. Peel your bananas before freezing, and chop them up a bit. A large frozen banana is harder to break up than a bunch of smaller chunks. Your blender will thank you later. Prep your toppings the night before, and store them in a mason jar or container. Then, the next day all you have to do is wake up, blend frozen fruits, pour, andddd sprinkle all those good toppings on top. 🙂 Time saved! If you have to eat your breakfast on the go - forget the bowl! Pour your smoothie into a large cup and add the toppings anyway! Who says it needs to be in a bowl? Not me! Breakfast is always one of those things many people struggle with. There isn't enough time. You gotta run out of the house. You don't want to wake up 30 minutes earlier just for food, or do you? Maybe you do (food > sleep, sometimes) but mostly you don't. 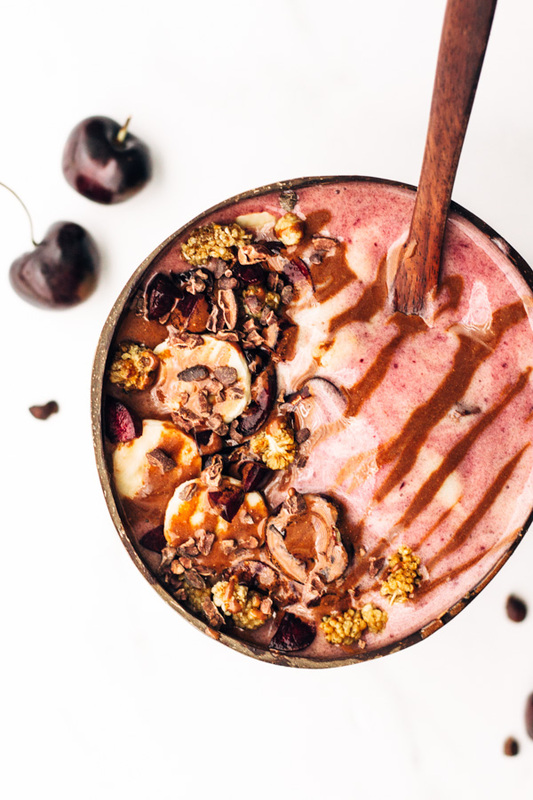 Well, fruit smoothie bowls, specifically THIS chocolate cherry breakfast fruit smoothie bowl will hit just the spot. And you get to sleep in, mostly. And you get to start your day with a tasty, but also super healthy meal that is going to nourish your body until lunch time! Want to see more vegan breakfast ideas? If you're into fruit smoothie bowls - check out this blue galaxy breakfast bowl (hint: it's blue! ), or if you prefer to chew on something - try this crunchy cardamom cinnamon oil free breakfast granola recipe. 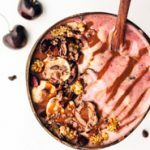 A simple vegan breakfast smoothie bowl made with chocolate, cherries, and bananas. Add frozen bananas and cherries to a high speed blender or food processor, and process until smooth. Add non dairy milk bit by bit to help blend the frozen fruits. Pour smoothie into a bowl. Make chocolate drizzle. Mix agave (or your choice of liquid sweetener) and cacao powder in a small bowl until evenly combined. Add toppings to your bowl. Sliced bananas, more fresh cherries cut in half, mulberries, cacao nibs, chia seeds or hemp seeds (for extra protein) and chopped nuts are all great additions, and bring in more nutritional value to the bowl. Finish it off with the chocolate drizzle, and enjoy! Best enjoyed if consumed right after making. Get creative! Use your favorite toppings and fruits. For ultimate creaminess – use a high powered blender like a vitamix. Food processors work really well too but the end result is not as creamy.